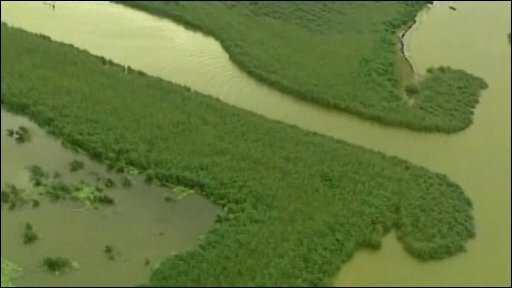 Criticism of BP is mounting in the US over its handling of the huge oil spill in the Gulf of Mexico. Homeland Security Secretary Janet Napolitano urged BP to commit more resources to tackling the catastrophe. 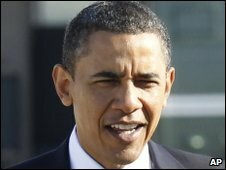 Critics of the British oil giant also include President Barack Obama, who is due to travel to the region on Sunday to assess efforts to contain the spill. 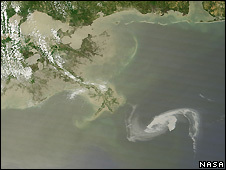 The sprawling oil slick has begun washing up on the Louisiana coast and is threatening three other states. Up to 5,000 barrels of oil a day are gushing into the sea after the BP-operated Deepwater Horizon rig exploded and sank last week. BP's chief executive Tony Hayward is flying to Louisiana later to personally oversee the emergency mop-up operation. Two natural gas platforms in the Gulf of Mexico had halted production because of the slick and one of them had been evacuated as a safety precaution, the command centre co-ordinating the response said. It said the gas production affected represented less than one-tenth of one per cent of the Gulf of Mexico's daily total. Analysts say the spill could rival the 1989 Exxon Valdez disaster as the worst in US history. Mississippi, Alabama, Louisiana and Florida have all declared a state of emergency. Animal rescue groups have been receiving their first patients - seabirds coated in oil. Worsening weather conditions have been hampering efforts to contain the slick, now more than 130 miles (200km) long. A BBC correspondent in the area says that at the moment the wind is keeping most of the oil offshore. But the choppy seas mean that smaller boats that could help clean up the slick are unable to go out. Forecasters also warned that strong winds over Sunday could push the oil into inlets, ponds and lakes in south-east Louisiana. The homeland security secretary flew into Louisiana on Friday to deliver a stark message to BP, which had been leasing the rig. "We continue to urge BP to leverage additional assets to help lead the response in this effort," said Ms Napolitano. After several unsuccessful attempts to plug the leak, she said, it was "time for BP to supplement their current mobilisation". BP's shareholders would probably prefer a few years out of the limelight after a five-year period in which the firm's reputation has been blown about. The fire at a Texas City refinery, the leak of an Alaskan gas pipeline and the sudden departure of former boss Lord Browne, have all been PR disasters. But this Gulf of Mexico leak may surpass all of them. Apart from the environmental catastrophe, £10bn ($15bn) was wiped off the value of Britain's third-largest company this week. And now we learn that BP is not even covered by any external insurance and will have to meet compensation claims from its own resources - at a cost of billions of dollars. And that does not even put a price on the damage to the reputation of a company which describes itself as "Beyond Petroleum". Some 1,900 emergency workers and more than 300 ships and aircraft are being sent to the disaster zone, President Barack Obama has announced. In a White House statement, he said BP was "ultimately responsible... for paying the costs of response and clean-up operations". Correspondents says the White House is desperate to avoid the kind of disaster that Hurricane Katrina brought to the region in 2005. The president said he had asked Interior Secretary Ken Salazar to conduct a "thorough review" of the catastrophe and report back in 30 days on ways to prevent a repeat. As the first strands of the slick reached the coast, Louisiana Governor Bobby Jindal said the oil firm did not seem prepared for the clean-up job. "I do have concerns that BP's resources are not adequate," he said. The first lawsuits have already been filed on behalf of fisherman, in what could end up as a barrage of litigation. BP spokeswoman Sheila Williams told AFP news agency the energy firm was prepared to assume costs for the clean-up and for damages. The BBC's business correspondent, Joe Lynam, says that BP has no external insurance cover in the traditional sense, instead using a form of "self insurance" to cover major events like this. The company would therefore have to cover the full cost of any legitimate compensation claims from the oil spill from its own resources, our correspondent says. The oil giant's chief operating officer, Doug Suttles, said it had mounted "the largest response effort ever done in the world". BP says it has begun using dispersants underwater in an attempt to break up the leaking oil at its source. The oil giant has also dispatched remotely operated vehicles to try to shut off an underwater valve, so far without success. The firm is also having a relief-well drilled to slow the leak, though experts say that could take up to three months. US Air Force planes have been deployed to spray oil-dispersing chemicals off the coast of Louisiana. Two C-130 Hercules cargo planes will join civilian aircraft that have been dumping chemicals to break up the slick. The US Navy and Louisiana National Guard have also been mobilised. Fishermen - who face losing their livelihood from the spill - have been drafted in to help. Wetlands off the Louisiana coast sustain hundreds of wildlife species and a major seafood and fishing industry. The cause of last week's blast, which left 11 workers missing, presumed dead, remains unclear. It has emerged that BP last year downplayed the possibility of such a disaster at the offshore rig. In BP's 2009 exploration plan for the well, the firm suggested an oil spill was unlikely or virtually impossible, AP news agency reports. The US government said on Friday it was putting on hold all new offshore drilling until the cause of the spill is investigated. Last month, President Obama eased a moratorium on new offshore drilling.